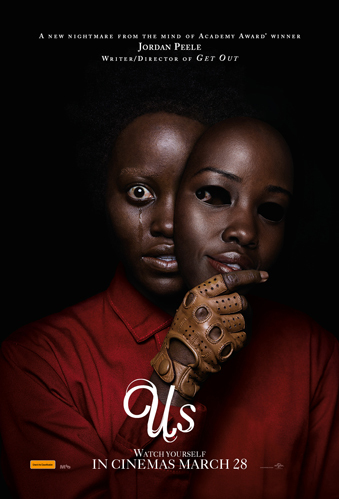 After sending shockwaves across contemporary culture and setting a new standard for provocative, socially-conscious horror films with his directorial debut, 'Get Out', Academy Award-winning visionary Jordan Peele returns with another original nightmare that he has written, directed and produced. Set in present day along the iconic Northern California coastline, 'Us' stars Oscar winner Lupita Nyong’o as Adelaide Wilson, a woman returning to her beachside childhood home with her husband, Gabe ('Black Panther’s' Winston Duke), and their two children (Shahadi Wright Joseph, Evan Alex) for an idyllic summer getaway. After spending a tense beach day with their friends, the Tylers (Emmy winner Elisabeth Moss, Tim Heidecker, Cali Sheldon, Noelle Sheldon), Adelaide and her family return to their vacation home. When darkness falls, the Wilsons discover the silhouette of four figures holding hands as they stand in the driveway. 'Us' pits an endearing American family against a terrifying and uncanny opponent: doppelgängers of themselves. The 'Us' competition has now closed. Winners will be announced shortly. Competition opens at 5pm AEDT on Sunday 17th March 2019 and closes at 11:59pm AEDT on Sunday 24th March 2019. Five winners will be chosen at random on Monday 25th March 2019. To successfully win, entrants must fulfil the above entry conditions before the time the competition closes. Current members/followers are eligible to enter the competition. Only one entry per person. Only one winner per household. To be a valid winner, the entrant must not have won a prize from SWITCH within the last 28 days. Each winner will receive one double pass to 'Us'. By entering, you agree to receive occasional emails from SWITCH in the future. If you decide to unsubscribe from these updates, any further entries will not be applicable. Only Australian residents are eligible to enter. 'Us' is in cinemas from Thursday the 28th March 2019 through Universal.